Autumn has found us with its cooler nights and misty mornings. The forecasts are greyer and wetter, and the daylight hours fewer. Here’s what we’ve been up to these last couple of months. We continued to have a pile of visitors this fall giving us the wonderful gifts of their time and company. We had Ronan and Carrie here from Scotland harvesting tomatoes. Merinda, our first WWOOFer, helped us separate over 2000 seed garlic cloves. Jenn celebrated her birthday here and brought a party of 20ish friends who made quick work of stacking the last of the firewood out of the 2016 field, and rock and stick picking our new garlic beds. Em’s sister Laura and partner Kerri came over from Ontario and helped get the roof waterproof and the garlic in. Garlic: first Two Roads Farm crop planted on schedule!! A family Thanksgiving work party got a drain in. And, finally, Annie came over from Ontario and helped get some winter greens seeded and a bamboo plant burned that is threatening our septic. We have incredible friends and family. TL: Rock picking the 2016 garlic patch. Thanks Jenn for the photo! 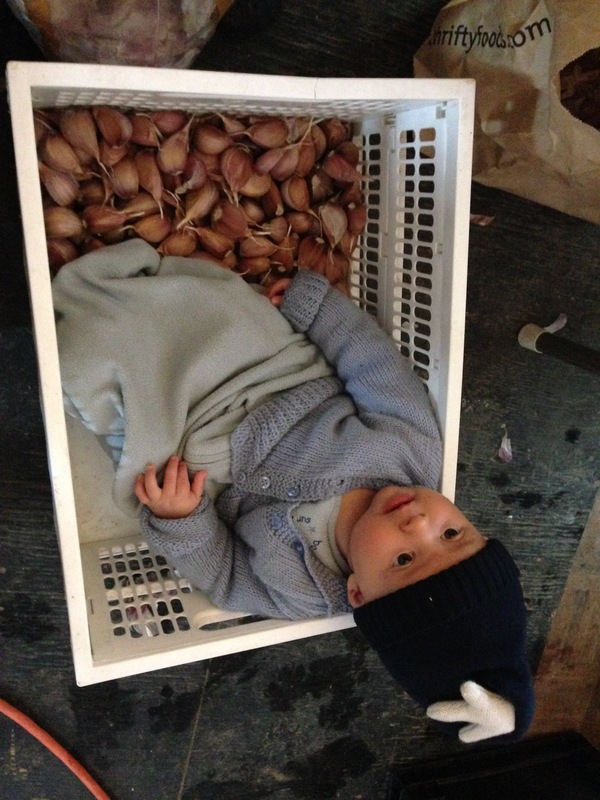 TR: Wilf in a bin of seed garlic. 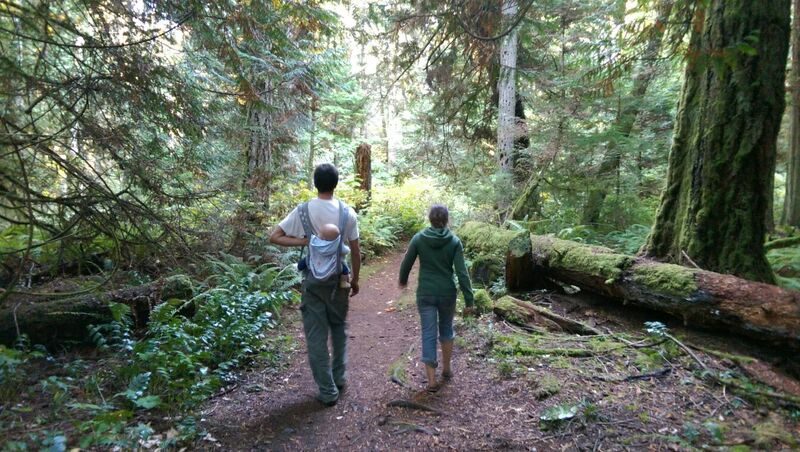 B: Visitors are a good excuse to get off the farm for a forest walk. Thanks Laura for the photo! Shortly after our last blog post, the deer finally discovered that our not-a-fence (bird mesh with flagging) is actually… not a fence. While we feel pretty fortunate to have gotten three full months deer-free out of our psychological deer deterrent, and had already harvested most of what they ate, it was still more than a little bit annoying to lose two plantings of lettuce, a week away from having heads ready for sale, and somewhat demoralizing to watch the garden shrink back each night as they nibbled our crops down to stumps.For anyone interested, we discovered that our deer seem to like Brassicas, lettuce, bean leaves, dill and carrot tops best. Chard and beets were left to last. They gave the squash, alliums and celery a miss. We experimented with a few more psychological deterrents – scarecrows, tarps, fishnet – but each night, three sets of shining green eyes would greet our flashlight checks. We finally gave up and threw some bird netting directly over the chard and our last planting of brassicas (hoping that maybe the need to eat their meal with dental floss would be enough to persuade them to dine elsewhere) and admitted defeat. While our dental floss trick seems to have saved us some chard, the brassicas had an added layer of row cover to keep them safe, which the plants haven’t exactly loved. We’ve lost just under half the broccoli and caulis to rot (presumably from the moisture trapped under the row cover), and the plants are small. Deer fence is a priority for this winter! 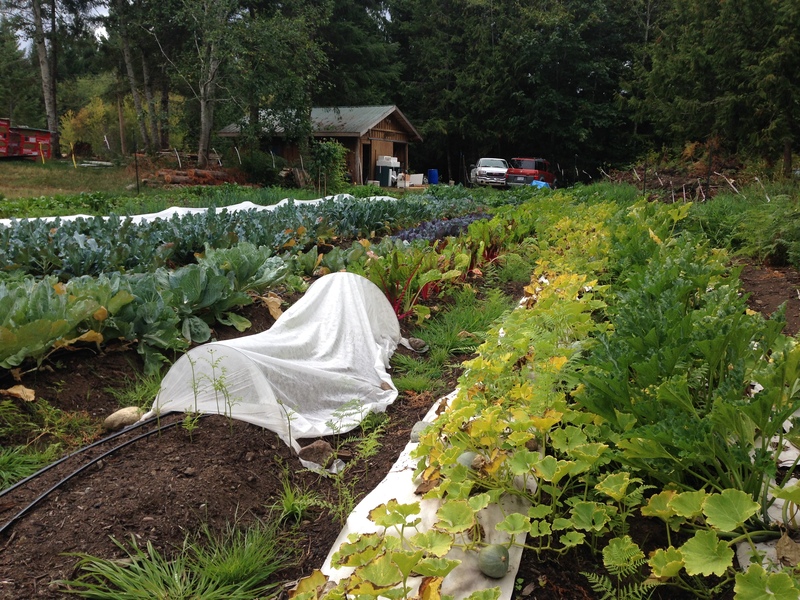 L: Brassicas hiding under row cover. 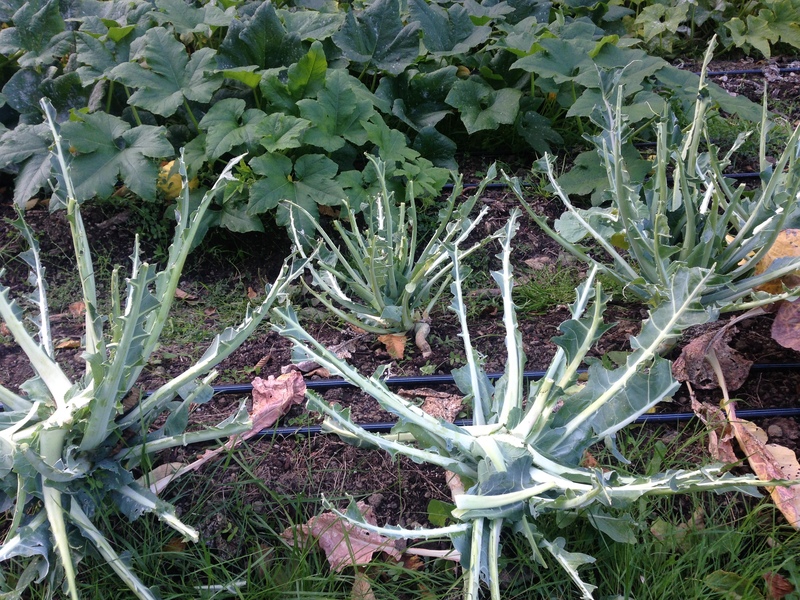 R: Skeletonized broccoli plants. Luckily, we had already harvested all of this broccoli! The end of summer brought with it a harvest bounty, as it often does. We still had summer zucchinis and tomatoes pouring in as the winter squash and leeks came ready. Our super late peppers started to ripen, the basil had a second coming, we started harvesting the next round of broccoli and cauliflower. It has been fun to bring a wide and colourful range of veggies to the Denman market to sell alongside our summer pork – made mostly into a delicious array of sausages. We also experimented with rendering lard – time-consuming, but a beautiful result. We’re selling some here on island, and the rest will go to the Homesteaders Emporium in Vancouver to make a specialty soap line for the holidays. 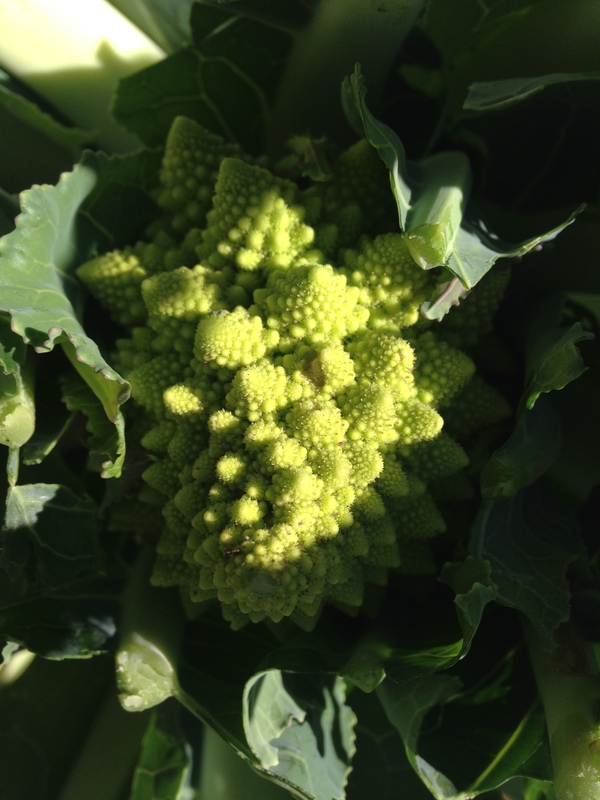 L: We brought a few beautiful Romanesco cauliflowers to market in early in the fall, before the deer got them. R: The early autumn garden with the zucchinis still going strong. We were given 11 layer hens at the end of August. They are settling in nicely. They won’t stay in their fence, but we can’t be bothered to fight with them about it – one lady in particular insists on spending every day exploring. 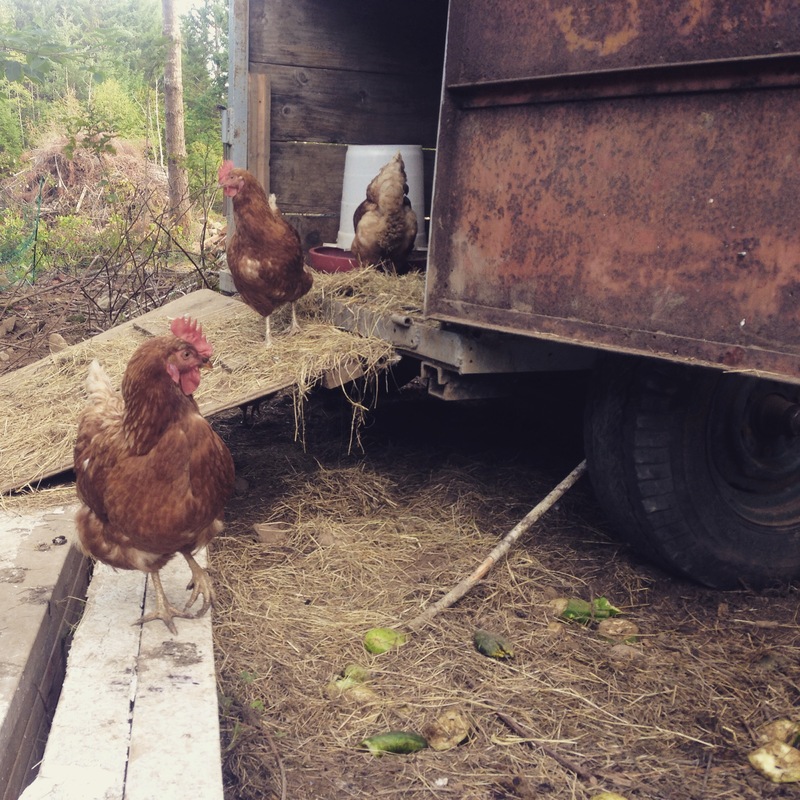 So the farm has gotten just a little bit more chaotic, with chickens popping up randomly in the middle of our days – one was even laying in the porch for a bit. We’re enjoying the eggs, and selling the extras at market, now that we’ve solved a raven theft problem we had for a few days. It was, knock on wood, pleasantly easy, just needing a bit of old fishing net draped across our chicken house door to effectively shrink the size of the opening. Our next pigs are unfortunately about two months behind schedule, a litter of Berkshires from Vancouver Island. We look forward to welcoming them to the farm in December. Finally. We are nearly there. 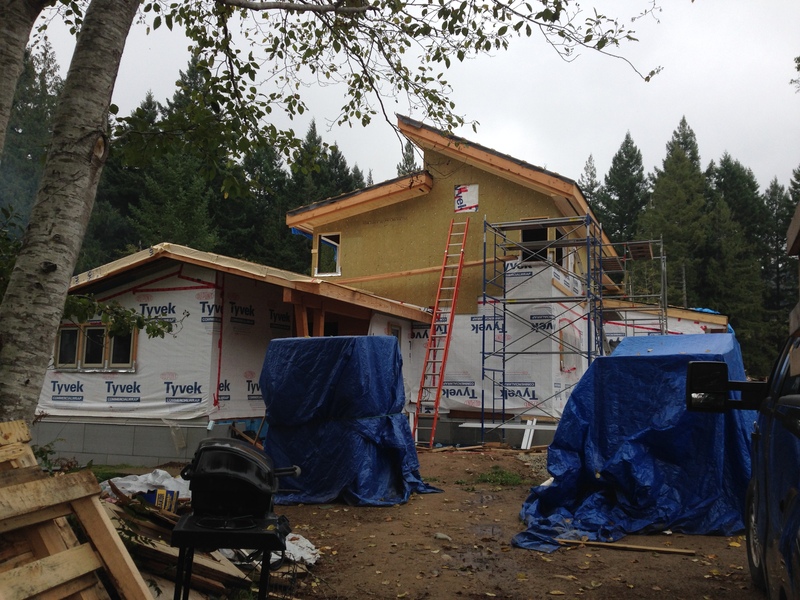 The roof is waterproof, the roofers booked, exterior insulation going on, last windows and doors going in. It’s looking like we should be at a point where we can take a much needed break from the house come the end of November. It is going to be very nice to shift focus to the farm and getting ready for the 2016 season. 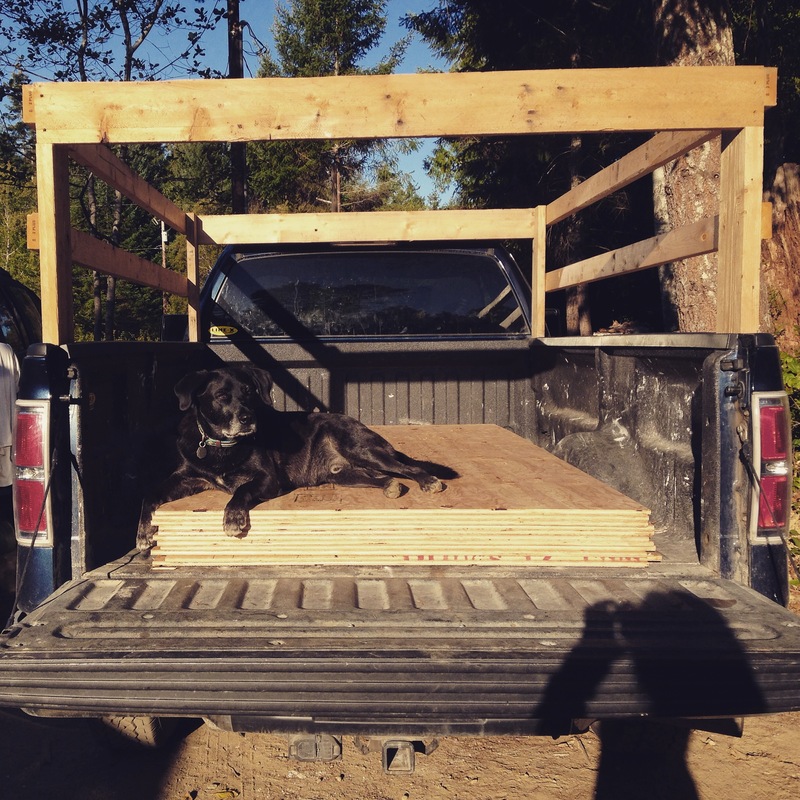 L: Hunter supervising a load of plywood arriving on the farm. R: Outsulation going on. The zucchinis are nearly dead and we’re entering into the, for us, less familiar territory of season extension and winter growing. 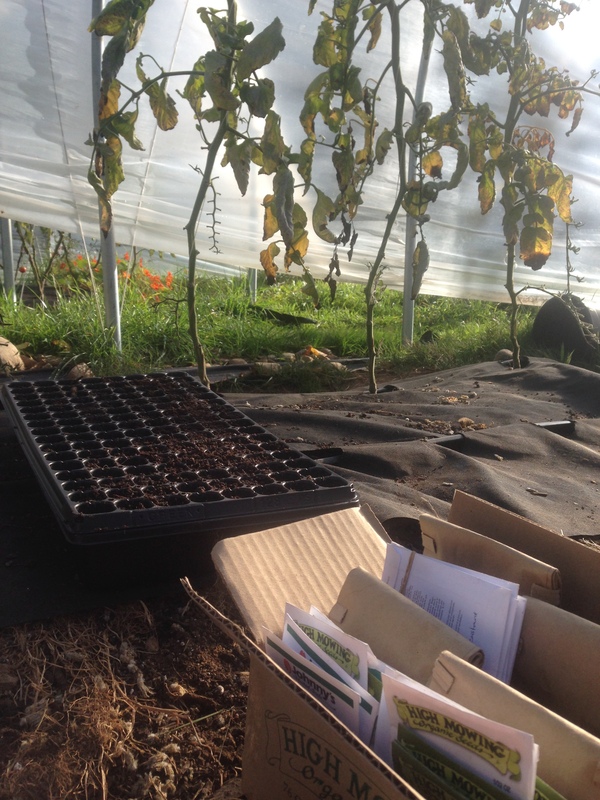 We’ve seeded greens to go in the greenhouses (late, like everything else this season, but coming! 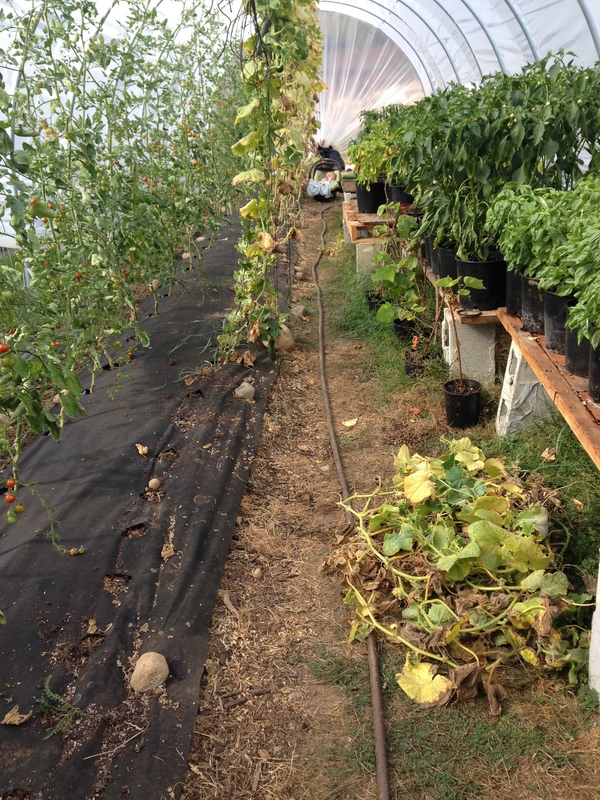 ), the basil and eggplants have come out, and tomatoes and peppers are on their last legs. We’ll be selling bits here on Denman, mostly just experimenting with what we can grow and what we can sell. Looking ahead to 2016, we’ve started to plan our purchases and the infrastructure that needs to be put in place this winter once all the construction materials are out of our outbuildings. Storage spaces, wash stations, road extension into where we want to run the pigs, walk in cooler… Lots to do. 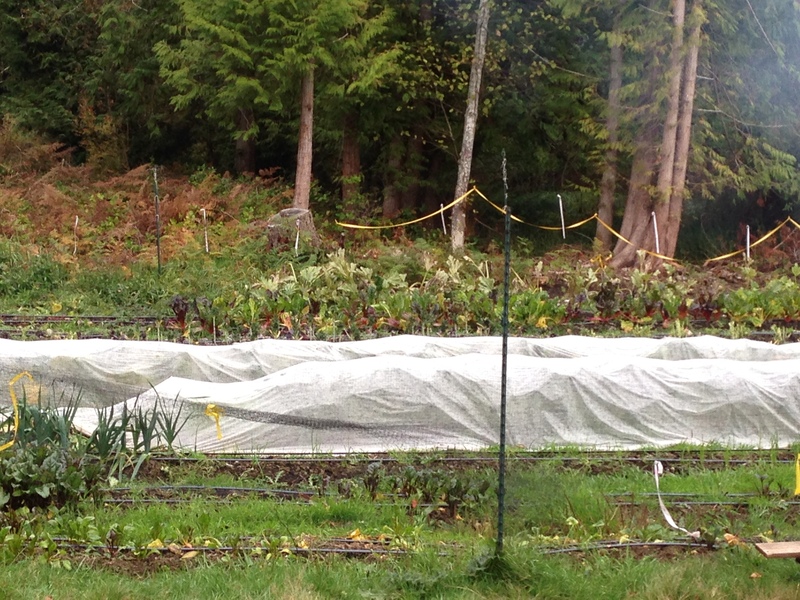 The garlic has gone in and been fenced and mulched – on time! Hopefully this sets a precedent! And, we’re starting to think about crop planning and what we’ve liked and not liked this season. Some favourites from the summer that are on the list for sure for next year are Carmen sweet peppers, small size cabbages, habenero hot peppers, and Blue Ballet winter squash. The rest will take some more thought and discussion.. perfect rainy day coffee activities! TL: Harvesting all the basil; making space for trays of winter salad greens. TR: Seeding winter salad. BL: Taking out the cucumbers. 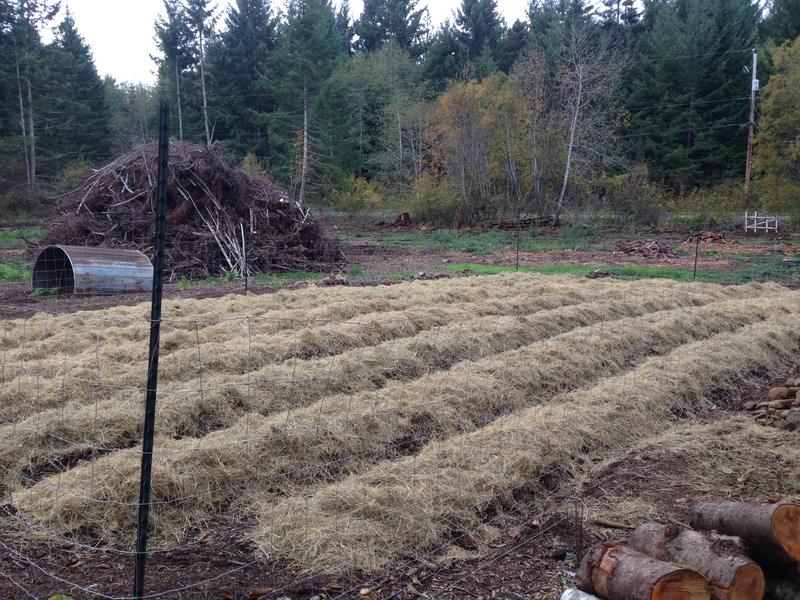 BR: Garlic mulched and fenced. ← Where has the summer gone? 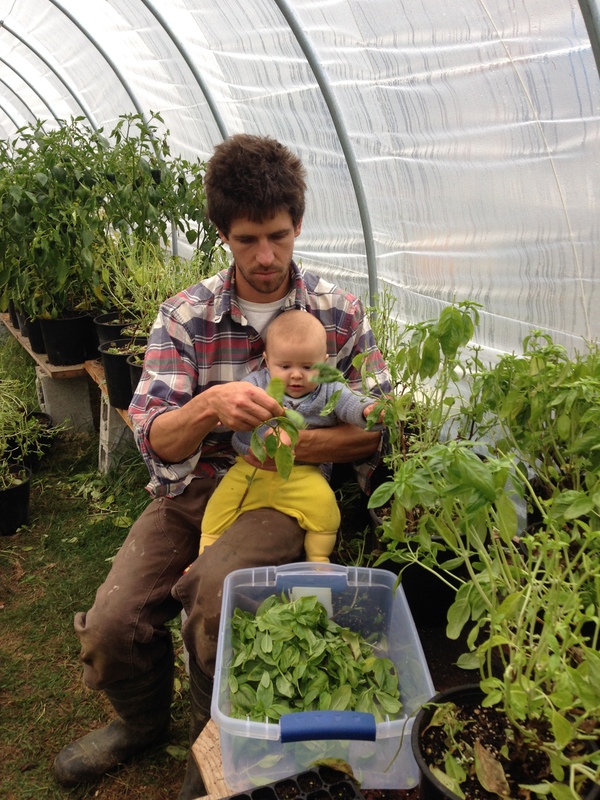 Thanks, Sam and Em, for sharing your homesteading stories–always a good read! i love that you guys are so organised! with all the data you’re taking in, observing, analysing and putting into new plans the farm will be super successful in no time! very impressed!